*A note stimulated by reading Norman Barry, “The Tradition of Spontaneous Order,” Literature of Liberty, V (Summer 1982), 7-58. This emphasis is misleading. Individuals do not act so as to maximize utilities described in independently existing functions. They confront genuine choices, and the sequence of decisions taken may be conceptualized, ex post (after the choices), in terms of “as if” functions that are maximized. But these “as if” functions are, themselves, generated in the choosing process, not separately from such process. If viewed in this perspective, there is no means by which even the most idealized omniscient designer could duplicate the results of voluntary interchange. The potential participants do not know until they enter the process what their own choices will be. From this it follows that it is logically impossible for an omniscient designer to know, unless, of course, we are to preclude individual freedom of will. The point I seek to make in this note is at the same time simple and subtle. It reduces to the distinction between end-state and process criteria, between consequentialist and nonconsequentialist, teleological and deontological principles. Although they may not agree with my argument, philosophers should recognize and understand the distinction more readily than economists. In economics, even among many of those who remain strong advocates of market and market-like organization, the “efficiency” that such market arrangements produce is independently conceptualized. Market arrangements then become “means,” which may or may not be relatively best. Until and unless this teleological element is fully exorcised from basic economic theory, economists are likely to remain confused and their discourse confusing. 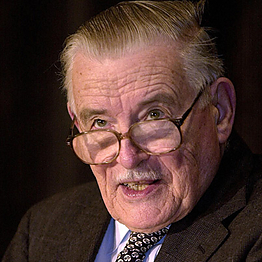 James M. Buchanan — 1919 – 2013 — RIP.